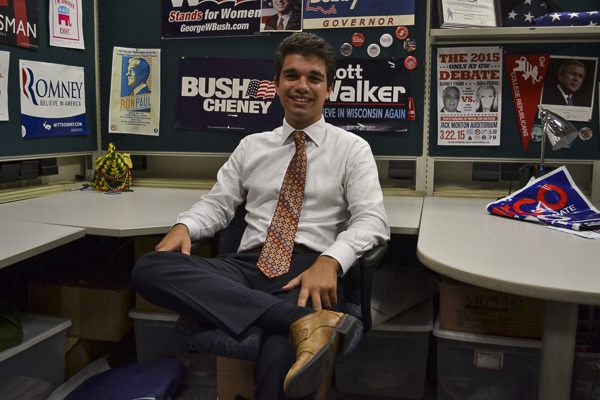 Austin Hansen, the co-chair of the GW College Republicans, said the group will campaign for other Republican offices this election season, even though the group will not endorse presidential candidate Donald Trump. Updated: Sept. 15, 2016 at 3:28 p.m.
GW’s College Republicans are sticking with their decision not to endorse Donald Trump in this presidential election. The group announced in a statement this summer that they will not endorse the Republican presidential nominee, citing an array opinions within their membership about the national party’s candidate selection. The group said they continue their commitment to their conservative ideology throughout the rest of the election season, a response other political groups on campus said they commend. Austin Hansen, the chairman of College Republicans, said there is no precedent requiring the group to endorse or not endorse a nominee of the Republican party. “We will continue to be the platform for our members who do support Mr. Trump’s nomination for President while also actively providing a venue for our members to voice an altering vision for our party’s future,” Hansen said. Hansen said that although the group’s executive board is split on the decision, the organization’s general body seems to be satisfied with the choice, adding that he personally will remain neutral to the public, too. “I firmly believe our current stance is the optimal decision for our membership,” Hansen said. Despite the group’s neutral stance on Trump as a candidate, Hansen said members of the organization will continue to represent Republican philosophies by campaigning at local, state and national levels for candidates who exemplify values like limited government, capitalism and individual liberty. Several national Republican factions have refused to endorse Trump, who won the party’s nomination in July. Allie Coukos, the director of public relations for the College Republicans, said the neutral stance still clearly opposes Democratic presidential nominee Hillary Clinton. “Because Trump is such a polarizing candidate there are parts of our membership who feel very strongly either for or against him, and our neutral stance will ensure no one feels alienated within our organization,” Coukos said. Coukos added that if students within the group want to campaign for Trump, they can. Lande Watson, the president of the College Democrats, said the organization commends the College Republicans members who actively oppose Trump. Other universities’ College Republicans chapters have also chosen to not back Trump. The Ithaca College Republicans asserted that they will not endorse Trump, according to The Ithacan. The Cornell College Republicans went one step further, not only refusing to endorse Trump but throwing their support behind Libertarian candidate Gary Johnson for president, according to the Cornell Sun. In response to the action taken earlier this month, the Cornell College Republicans had their recognition revoked by the New York Federation of College Republicans. The Hatchet incorrectly spelled Allie Coukos’last name. It is now correctly spelled. We regret this error.